Don't they have the same keyboards as the Sequential T8? Ooh, they'd make nice controller keyboards if they were just a little cheaper. And my studio was twice as big. And I'd taken complete leave of my senses. 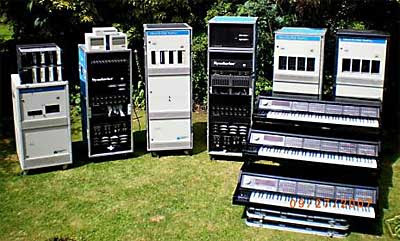 Oh I'm sorry, I'm a late 80s electronic musician who lusted after machines like this and the Fairlight CMI. Although frankly, now, they'd be nothing more than items mentioned in my divorce hearing if I were to buy one. Hom hum. "Now used by such contemporary artists as Coldplay"
Because when I think Synclavier, I immediately think Coldplay. Why on Earth would you write this? Is there a Coldplay fan out there, just searching for Coldplay-related items, who's going to buy 3 Synclaviers on a whim? Is there an old-timey academic synth geek out there, just teetering on the edge of buying this stuff, who's going to read that and be pushed over the edge? Ha ha this potentially the funniest comment this year. I have been the lucky owner of this for 10 years, and am now looking to pass on to a good home.